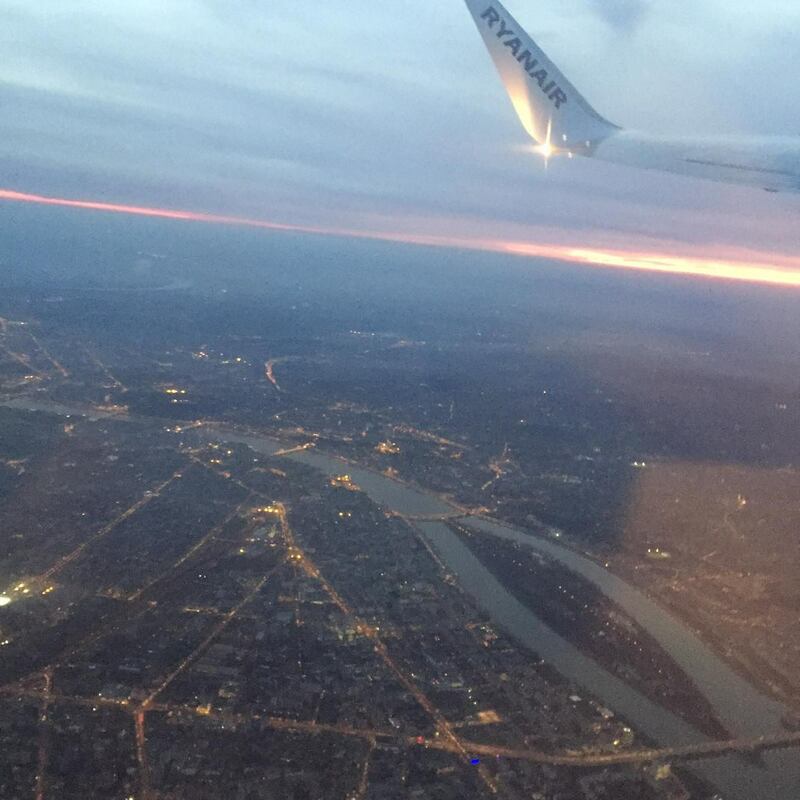 Hello and welcome to my third and final Budapest blogpost! You can find part 1 here, and part 2 here! Whilst the first two posts covered 1 day, this last post covers the final day and a half. I decided to take less pictures on these days as I wanted to spend less time behind the camera! I spend too much time behind screens so I wanted to just allow myself to enjoy it and take it all in! 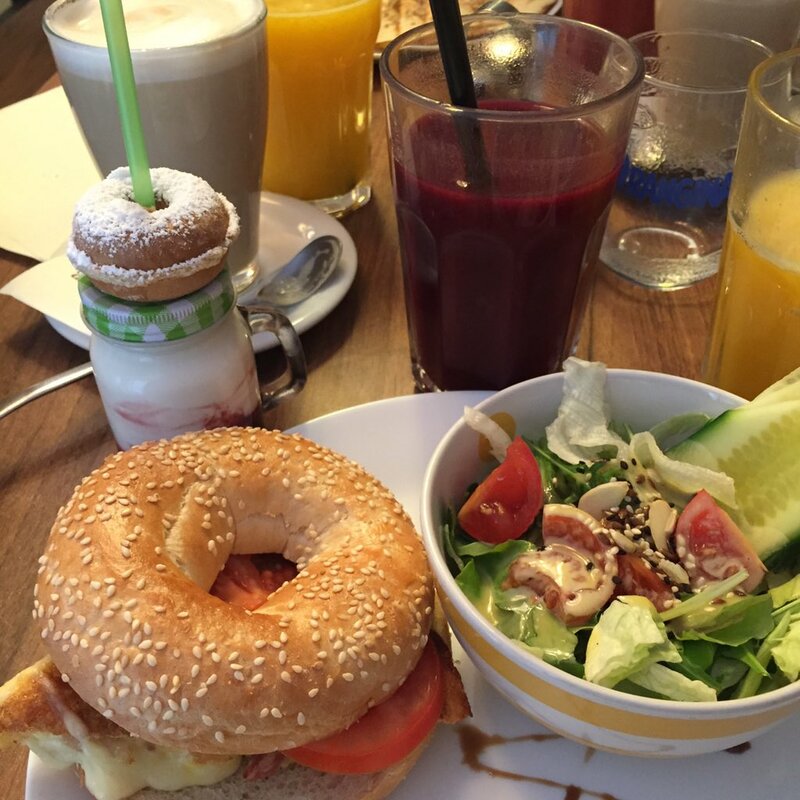 First of all, we went for breakfast at Blue Bird Cafe! This place took us AGES to find, and I also had a rip in the heel of my shoes which meant my feet were soaked immediately. Not a good start to the day! We walked through a lot of central Budapest on our way there, and it was nice to see more of the city. A sentiment I fully agree with. These pancakes were mini and adorable! We visited on Monday, a quiet day in Budapest, and as we had quite a large order between us, it took some time, however I don’t think it took any longer than you’d expect in any restaurant! For this I was given a free latte! The staff were amazing friendly and helpful, I would recommend this place a million times over. Plus they had this as the FLOOR downstairs. Next we headed off to a Ruin Bar! This was literally round the corner, and I’ve forgotten it’s name sadly, but the decor was amazing! We sat in an area full of forgotten and abandoned technology from the 80’s/90’s, whenever! There was even a geiger counter in the mess of the wires. Like all drinks in Budapest, it was extremely cheap! I had a whisky, I can’t remember the brand, but I do remember that it was only about £2! 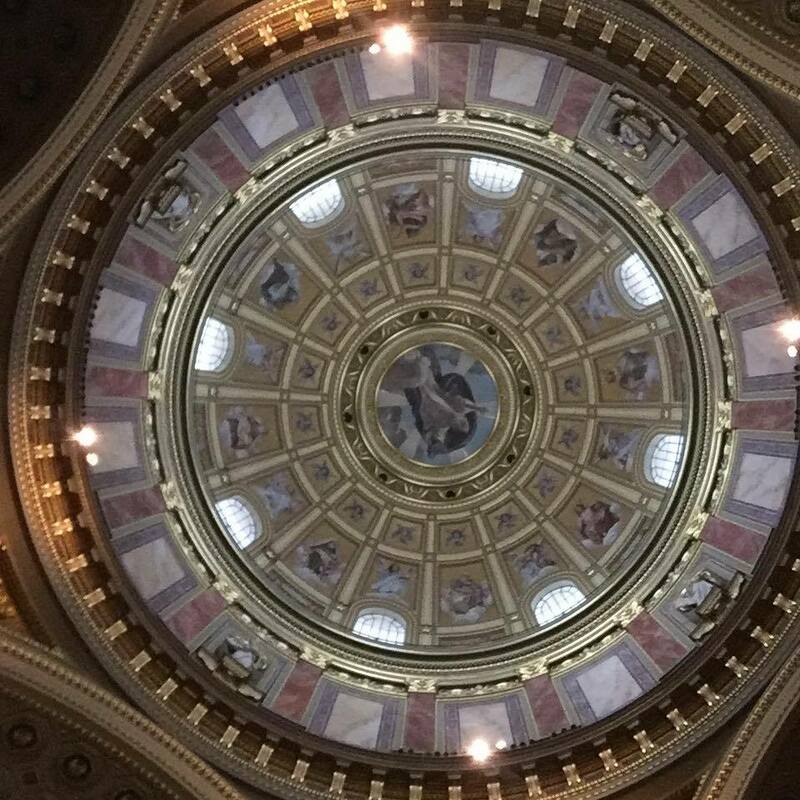 Next we headed off to St. Stephen’s Basilica which you will have seen in some of the photos in the last post! I switched my camera off inside, as it was completely silent and some people were in prayer. My camera makes a rather loud shutter sound and it felt inappropriate to disturb people with it. However, I did take this picture of the dome with my phone. It in no way captures how grand it was! This filled an hour of our day, and all it cost was a small donation to the church. This is where my pictures end for that day! After this, some of us headed to the Szechenyi Baths. I left my phone and camera behind as water was everywhere as you can imagine! These are thermal baths, with the biggest located outside. This was one of the best things I have EVER experienced! I really loved being in a warm relaxing bath whilst it lightly rained and was getting dark and darker! It was an odd experience, realising I’m in a massive outdoor bath in the middle of a European capital, with people from all over the world. There were massages and other treatments available, but we stuck to the baths! There were some inside, one of which was the perfect temperature, about 10 degrees celsius hotter than the outside baths, but I like my showers hotter than Daenerys Targaryen does (fire cannot kill a dragon), so this might not be perfect for everyone! There were two saunas also, one between 45 and 50 degrees, the other between 80 and 100. I tried the former and ended up leaving within 30 seconds struggling to breathe and with tears dripping down my face. We debated trying the hotter one, but after seeing it was recommended to go in a pool which was -16 degrees afterwards, as well as an ice bath, or to go lie down and not move for a good while, we decided against it! I would definitely recommend this, for a day pass to all baths, with a private changing room rather than locker, it only totalled around £13, and I shared the room with a friend! Don’t miss out on this if you find yourself in Budapest! On the final day, we went for breakfast in a little place down the same road as our Airbnb! It was great, Budapest does some amazing food. Then we walked to the House of Terror, some pictures of this walk you can see below! The cabs are yellow! It reminded me of New York! But also got me thinking, why are cabs always such an iconic thing? We have the typical British black cab, and now I’m interested in what they’re like worldwide. This is the House of Terror, former Nazi and Communist headquarters renovated into a museum dedicated to victims of both regimes. It was incredibly interesting and impressive, however, as we had a flight to catch, we only managed to spend around 20 minutes inside! If I ever go back to Budapest, this is at the top of my to do list! Half of my group (including me) have studied terrorism and the effects of it as part of our law degrees, and so found it fascinating to learn about. Thankfully, they provided a lot of English handouts which I read on the plane! Until I got too tired and had a nap. And here we are at the end of these three blogposts! I hope I managed to give you a bit of a successful taste of Budapest! I would recommend it wholeheartedly! The flights are not too expensive, nor is accommodation, and the city itself is very cheap compared to British standards. I have never gotten such amazing food for such a low price before!